Maria Spivey was born at Winster, in the county of Derby, April 2nd, 1839, and departed this life at Maryport, Cumberland, February 12th, 1902. Her parents were members of our Church, almost from its origin. She gave her heart fully to God when about 15 years of age, and at once joined the Church and remained a member to the end of life. From quite a little girl she collected funds for the missionary cause, and in her teens became a Sunday-school teacher. Her parents’ home being a resort for the preachers, both travelling and local, she had a vivid recollection of some of the old preachers. 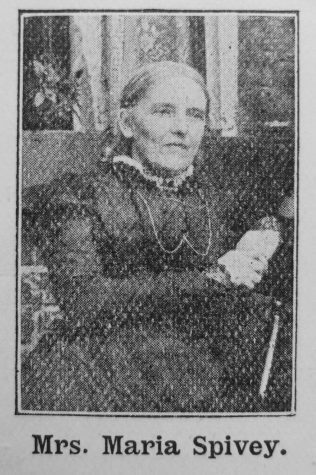 She would speak with evident pleasure of Beckerlegge, Booth, Hurd, Watts and Price, who helped her in early life by their conversation, prayers, and ministrations. At Colne she started a young woman’s class which was very successful. At Alston she conducted a young women’s Bible class most efficiently. Her health broke down on the Donnington Circuit, and she has never been the same woman since. “In sickness let me not so much say, am I getting better of my pain, as am I getting better for it!” Mrs. Spivey got better for it. She walked on a higher plane. It brought her into closer touch with Jesus Christ and His Church. It broadened and deepened her social and religious sympathies. Mrs. Spivey was an angel among the suffering poor; had one a burden she would gladly carry it; had one a grief, in her own breast she would willingly share it. She went about doing good. The last six months of her life were full of storm. In October last her eldest son, Willie, who had won for himself a distinguished and honourable position in the University of Cambridge, and who was respected and beloved by all who knew him, was called home through an explosion after twelve days suffering. This unexpected blow almost stunned her; for Willie was the joy and pride of her life, and inherited much of her quiet and unselfish disposition. In less than a month after she had lain Willie to rest, she was summoned to the sick-bed of her youngest son, Harold, who, after a week’s illness, sank into the repose of death. “I do hope I shall not lose my faith in God,” she said as we carried her youngest son to the grave. Poor dear woman! she seemed frightened, bewildered, lest she should lose her way. Time is generally the best doctor in such cases, but it cannot bind up a broken heart. With care and attention she recuperated wonderfully, and began to be like her old self again in the home, though somewhat weak in body. On Saturday, February 9th, her brother, the Rev. George Newton, came to Maryport. He preached there on Sunday evening, and Mrs. Spivey was present to hear him. On Tuesday following she was busy all day preparing material for a sewing-meeting to be held the next day. Her brother and Mr. Spivey went out to a Missionary meeting at Ellenboro’, and on their return the family took supper together, after which, she and her brother conversed in a cheerful mood about their early days and the people of “Auld Lang Syne.” About midnight they retired to rest, without any idea that death was going to throw his “fatal shaft.” On getting into bed Mrs. Spivey was seized with a choking sensation; her heart ceased to beat, and her spirit took its flight to the light and glory of the redeemed in heaven. She died in harness, and ceased at once to work and live. We mourn that she has been called from her loved ones here, yet we cannot but feel some degree of thankfulness that she is at rest after all the pain and grief and loss of these past few months. We laid her by the side of her loved ones, in Colne cemetery. At the request of the Nonconformist ministers of the town, a united memorial service was held in our chapel at Maryport, on Sunday, March 9th, and the writer gave an address. It was an impressive service. Maria was born at Winster, Derbyshire to parents William Newton and Hannah Titterton. Her parents were both Primitive Methodists. William was a lead-miner and local preacher. Maria married William Spivey (1838-1913) on 31 October 1867 in the Bakewell Registration District, Derbyshire. Census returns identify six children. William Thomas Newton (1869-1901) – died after an explosion shortly after graduating from Cambridge.